Already adopted? This fourth way to help pets will be easy for you! 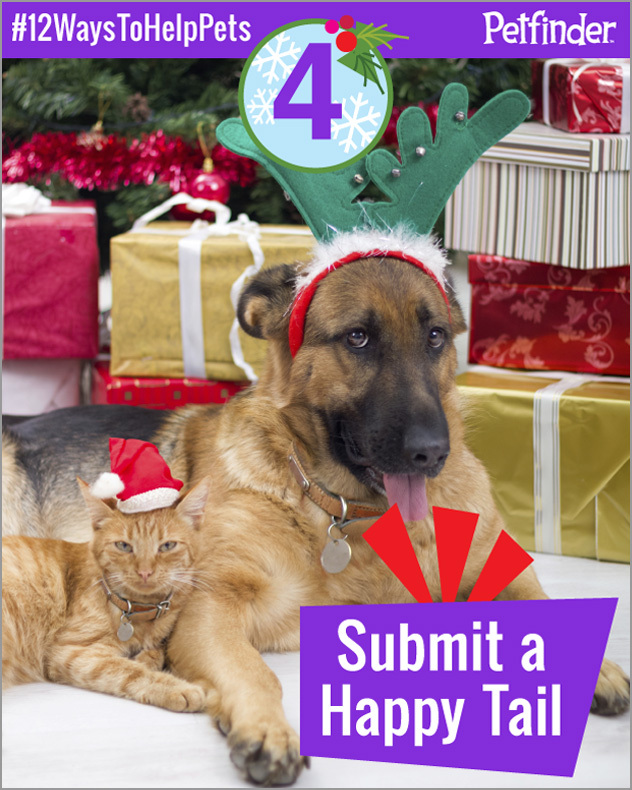 Learn how Happy Tails help pets, then be sure to pledge to help pets for a chance to win! Each month visitors to Petfinder look at an average of 50,000 pages of happy tails. How does this help homeless pets? These stories may encourage people who are considering adopting to take the leap. They also provide inspiration and encouragement to shelter and rescue workers and volunteers to remind them of the impact of their work. Submitting your own positive experience may give people the little nudge they need to adopt or keep working and hoping. Happy Tails also help educate visitors and offer support as well. Candace Slocumb’s Happy Tail shows that Pit Bulls aren’t the scary dogs some sensational news stories make them out to be. In fact they make wonderful pets. They adopted a two-year-old Pit Bull, Dixie, at Gwinnett County Animal Control and Welfare in Georgia and have had nothing but love and joy from their experience. Read more about pit bulls. Stella Luna dispels the idea that black cats bring bad luck. 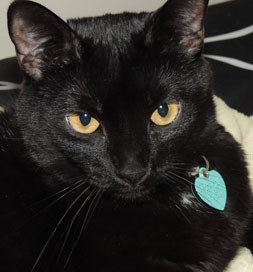 Or take Victoria Greenleaf’s Happy Tail about Stella Luna, a beautiful black cat she adopted. Stella had been in the shelter for quite a while because some people are superstitious about black cats and won’t adopt one. Victoria notes that Stella is the “sweetest cat ever” — and her Happy Tail might prod someone to overcome their unfounded fears. Stella was at South Shore Humane Society, Braintree, MA. Rick Springer’s Happy Tail tells us that a dog can come with lots of issues, but they can also be the kindest and most gentle ones. They can teach us acceptance and patience. Rick adopted an English Bulldog named Gertie, who was heartworm positive, among other things. But finally he asks the oft-repeated question among Happy Tail writers: Who rescued whom? Stories about adopters’ experiences with young pets can help furnish support to other adopters, and the joys of older, more settled pets confirms that even senior companion animals can settle comfortably into new homes. You can teach an old dog new tricks. Your story doesn’t have to be one about adopting a breed that suffers discrimination or anything else so dramatic. By relating how loving pets of all sizes, ages, genders and breeds can bring joy to a family, you can help other people make the decision to adopt a homeless pet rather than buy one at a pet store. Share your story; make a difference. Don’t forget to take the pledge to help pets this holiday season for a chance to win!